Democrats vow to slow work in the Senate to the point of stoppage, protesting the secrecy around the GOP effort to repeal and replace ObamaCare. 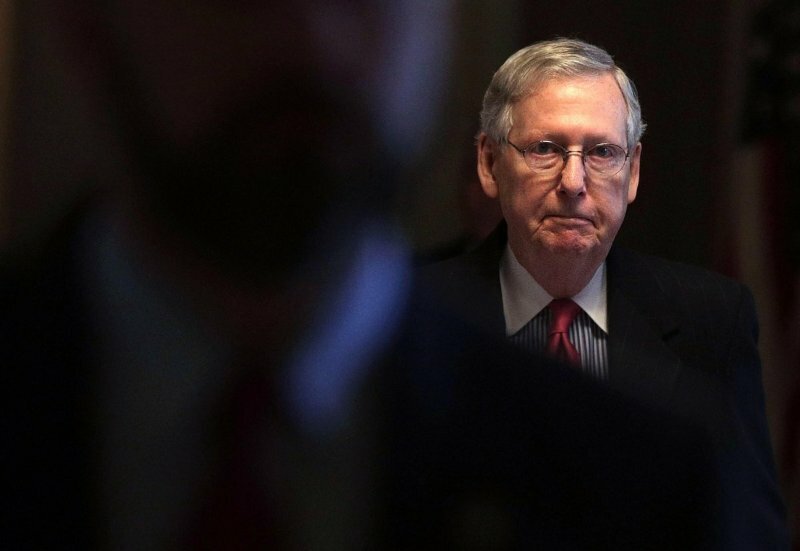 Majority Mitch McConnell has pledged a vote by the recess at the end of next week for the July 4 holiday. Democrats and activists are infuriated that the Republicans have not scheduled any hearings or a public bill-drafting session for their version of the American Health Care Act. The House of Representatives finally passed its bill in early May at the third attempt, but the effort faces a slim 52-48 Republican majority in the Senate. If the upper chamber adopts a different version, a reconciliation committee will have to prepare a final version for approval. Thirteen GOP Senators — all men — from 10 states are preparing the legislation behind closed doors. None of the Senators is from a State on the East or West Coast; together the group represents about 25% of the US population. If Republicans cannot hold a vote before July 4 break, lawmakers would have just three weeks to pass a Senate bill and work out differences with the House before an August recess. The Trump Administration also wants Congress to raise the government’s statutory borrowing limit by August, an effort which could face a fight in both houses. Republicans will try to pass the bill using special budget rules that would bypass a Democratic filibuster, limited debate to 20 hours. But they will face defeat if more than two GOP senators defect, and criticisms have been raised by moderates like Susan Collins of Maine and Lisa Murkowski of Alaska and conservatives like Rand Paul of Kentucky and Mike Lee of Utah. Before Congress adopted the Affordable Care Act, Democrats held numerous public hearings, and the Senate debated the measure on the floor for 25 days. Former National Security Advisor and Trump associate Michael Flynn is in more trouble over undisclosed contacts with foreign governments. The latest episodes include an unreported trip to the Middle East in 2015 to work on a US-Russian venture for nuclear energy in Saudi Arabia before Flynn joined the Trump campaign. Democratic legislators Elijah Cummings and Eliot Engel, the ranking members of the House Oversight and Foreign Affairs Committees, said Flynn may have had multiple contacts with Saudi officials that he failed to disclose. “Most troubling of all, we have no record of Gen. Flynn identifying on his security clearance renewal application – or during his interview with security clearance investigators – even a single foreign government he had contact with,” wrote Cummings and Engel in a joint letter. The Democrats have demanded documents related to all of the work on the Saudi nuclear venture. The Cummings-Engels letter, citing internal documents from companies involved, said the negotiations covered not only a Russian-U.S. effort to construct dozens of nuclear reactors but also a plan for Arab countries to repay the Russians with the purchase of “Russian military hardware”. Flynn has previously made belated disclosures, after his resignation as National Security Advisor in mid-February, that he and his companies received more than $55,000 from Russian entitities and more than $530,000 from a Turkish businessman linked to the Kremlin as well as the Erdogan Government in Ankara. Energy Secretary Rick Perry denies man-made carbon dioxide emissions are the primary cause of climate change. Perry’s comments echo those of Environmental Protection Agency head Scott Pruitt in March, when he aid he does not believe carbon dioxide is a primary contributor to global warming. Both men’s views contradict the conclusions of scientists at the EPA, NASA, and the United Nations’ Intergovernmental Panel on Climate Change. Gavin Schmidt noted that a paper he co-authored in 2010 used the phrase “principal control knob” but warned about the danger of “unabated” man-made carbon dioxide. Perry has the science exactly backward. Far from being climate change’s key cause, the world’s oceans are actually another victim of greenhouse pollution. Our oceans absorb millions of tons of carbon dioxide a day, making them dangerously acidic. They’ve also soaked up most of man-made global warming’s excess heat, putting tremendous stress on marine life. Donald Trump again conflates past and present, this time at a photo opportunity alongside visiting Panamanian President Juan Carlos Varela. The US turned over ownership of the canal to Panama in 1999. Trump has previously indicated that Frederick Douglass, the author and abolitionist, is doing great work despite having died in 1895.